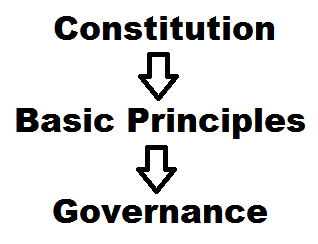 The constitution of any country is the foundational law which ordains the fundamental principles on which the governance of that country is based. It lays down the framework and principal functions of various organs of the government as well as the modalities of interactions between the government and its citizens. - Indian constitution is called “The constitution of India”. - It is the world’s largest constitution. - It is a borrowed constitution. - It is written constitution. - It is flexible as well as rigid. - Guarantees fundamental rights to every citizen. - Independent judiciary with power of judicial review. In 1946 Cabinet Mission Plan: Constituent Assembly to frame constitution for the country. Constituent assembly (CA) is partly elected and partly nominated. Provisional President of CA: Sachidanand Sinha. Permanent President of CA: Dr. Rajendra Prasad. Formation of Committees on various subjects. Drafting committee constitute of a Chairman (Dr. B. R. Ambedkar) with 6 other members. Drafting committee prepared Draft Constitution (DC) and submitted it to Constituent Assembly. In CA there was a discussions, Voting and amendment of Draft constitution. 26th Nov 1949 : 3rd and final reading of draft. Constitution Assembly adapted: “The constituent of India”. The constitution of India became partly enforced. 26 Jan 1950: Commencement of the constitution (Fully adopted/enforced). Total time taken: 2 Yr 11 month 18 days. What is the meaning of borrowed constitution? Borrowed constitution means Various provisions are taken from other constitutions. What is the meaning of written constitution? Unwritten constitutions are those constitutions where there is supremacy of parliament over constitution. Eg: UK, Newzealand. “Indian constitution is flexible as well as rigid” what does it mean? The constitution of India is flexible, it means it can be amended (Article:368). The constitution of India is rigid means some of its provisions can never be changed. Supreme court describe these provisions and called them Basic Structure. These basic structure of Indian Constitution are (i)Secularism, (ii)Free and fare election, (iii)Judicial review (iv)Supremacy of the court. “Indian Constitution establishes quasi-federal system” what does it mean? The phrase quasi-federal system is no where mentioned in the constitution of India. However it contains the quality of both quasi and federal system. Quasi system= A state with dual government system, where union list is greater than state list, Single citizenship and Authority of courts. Federal system= A state with dual government system, where state list is greater than union list, Double citizenship and Authority of courts. “Constituent assembly (CA) is partly elected and partly nominated” what does it mean? Pre-independence India was constituted of two types of states one called provinces (Govern by British Government) and the other princely states (Govern by Nawabs/Kings). 60% are provinces and 40% are princely states. In the Constituent Assembly members are elected from Provinces however members are nominated from Princely States, so called Constituent Assembly is partly elected and partly nominated.